Chasing Change: Is it Even Possible to Catch? Organizations are collections of people and resources designed to respond to the demands of the external and internal forces of change that relentlessly appear at an ever-accelerating pace. Whether it is competitive pressures, legal and regulatory reform, the latest technology upgrade, politics, or a new social media trend: all are making demands for change. When an organization is initially put in place, it is likely optimized to respond to the demands of the current environment. A short time later, these turbulent forces of change have presented new challenges that the organization is not optimally designed to address. As humans, we are fairly adept at responding incrementally to demands for change, albeit grudgingly. However, the demands for change today are often non-linear in nature, and an incremental response may be a fast track to bankruptcy. The gaps that are created as a result of the misalignment between the organization’s capabilities and the needs of the environment can eventually lead to organizational obsolescence and failure. What is suggested is a continuous external environment scanning and performance measurement process that facilitates just-in-time responses in the form of stronger organizational capabilities. Proactively developing organizational change resilience can, over time, result in more of a transitional or transformational approach to change versus a linear, incremental strategy. The physical/infrastructure dimension. This is usually the default strategy—responding to new demands for change with new technology or redesign of the organization. Building organizational capabilities in this dimension is generally implemented through project plans that measure results incrementally via cost and schedule indicators. It is what we know—it’s tangible, and can be measured without having to get into those soft and squishy people issues. The personal mindset dimension. This dimension is comprised of the individual values, behaviors, preferences, habits, and attitudes that eventually align, or misalign with the organizational cultural dimension. Ignorance of the importance of this mindset can be disastrous, because individuals can either be strong advocates for change, or major roadblocks that consume time and resources to address the resistance and mitigate risk. Building individual capabilities for personal change can be a major catalyst for successful change. Misalignment between organizational and personal values can create inefficiency and ineffectiveness, or even worse, can spell failure for any change initiative. Develop an organizational capability to continually sense and assess the external environment, because the predominant challenges for change will come from there. Utilize strategic frameworks like PESTEL, which facilitates inputs in Political, Economic, Socio-Cultural, Technological, Environmental, and Legal demands for change. In this age of information overload, utilize all your information technology resources to aggregate these factors from text analytics, social media, customer relationship management systems, competitive intelligence, and risk management systems. Know what is coming at you in time to apply the right capability to meet it, rather than shocked and surprised and thrust into reactive mode. Develop organizational capabilities in the organizational and personal mindsets to meet the challenges of change. Chasing Change offers an organizational self-assessment tool that facilitates measuring 13 critical attributes of the change-resilient organization, including leadership, innovation, risk tolerance, trust, commitment, accountability, empowerment, and others. Doing nothing and resisting the changes that challenge us is not a winning strategy. It’s been said that our bodies will replace every single cell every seven years, so change occurs whether you embrace it or fight it. Developing a change strategy that develops the organizational and personal capabilities to change faster than your competitors is not only advantageous, but depending upon the level of change, it may even be critical to survival. 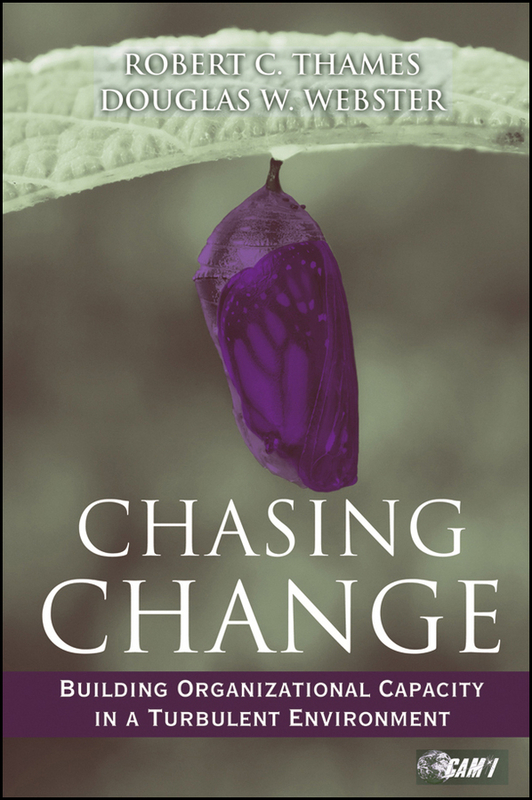 Autographed copies of Chasing Change can be purchased from the resources section of Bob’s website. Bob Thames is an internationally renown change management consultant and long-time colleague of Adventace® and Bob Junke, Founder & CEO. They worked together at both IBM and Arthur Andersen (Bob Junke as a consultant) bringing performance improvement backed by change management to those sales operations. 1 Conner, Daryl R. Managing at the Speed of Change, Random House, New York, NY, 1992, p. 176.